Below you can see the variety of projects Emil R. Moncivais has worked on during his distinguished career. Upon employing Town Planning and Design, LLC, you will receive the benefit of all of the skills necessary to guide these types of projects to completion. As the Planning Director for the City of San Antonio a redevelopment and revitalization plan was developed with the collaboration of the City of San Antonio and Federal Reality Investment Trust (FRIT), an equity real estate investment trust specializing in the ownership, management and redevelopment of high quality retail assets. The concept consisted of the redevelopment of five(5) city blocks in downtown San Antonio that starts at a corner next to the Alamo. It consisted of revitalization of a number of historic properties, the addition of a parking garage, landscaping with street trees and palm trees as focal points at major block intersections, a landscape courtyard and the addition of a new access point to the San Antonio River about 300 feet from the street’s intersection. FRIT funded the landscaping and the restoration of the historic structures and the City funded the parking garage, courtyard, and the river access. In addition, the Design Guidelines for Houston Street were developed by the department , with assistance from Winter and Company, to assure future redevelopment would respect the traditional historic street. Houston street has been a success with the addition of business such as Hotel Valencia and restaurants such as Bohanan’s, The Palms, LeMidi, and Acenar. This redevelopment has added to the vibrancy and pedestrian activity during the day and night along this once historical commercial street in the heart of downtown San Antonio. In June 2003, as the Planning Director for the City of San Antonio, the Planning Department led the development of a master plan for 80 square miles in the southern rural environment of the city. This was a major effort to develop a new paradigm for the growth and development of the City so existing and future citizens had an option, as oppose to conventional subdivision development, to live in an area that was sensitive to the environment and where they could live, work and play. The key to the planning effort was the use of a new state law that created a City South Management Authority with the ability to zone property in the extra territorial jurisdiction. The effort involved numerous stakeholders of divers interest such as developers, school districts, environmentalist, historic preservationist, long time residence, the City and Bexar County. The planning effort won the 2003 Texas APA Project Planning Award. It established sustainable design principles and practices, created greenways along roads by developing open space and hike and bike trail network to buffer uses and provide access to recreation water amenities, provided parkways, incorporated traditional building styles and design with nature, promoted high density town center type of development and set aside as much as 25% of developable land for agricultural use and encouraged compact mixed use town center development to maintain rural character. In January 2008, a new urbanism form based zoning code was added as an option for land development in the area. Thus, further promoting the original concept of a mixed use pedestrian oriented environment. This seven miles long corridor consist of the Ft. Worth Medical District on one end and the Fairmount Historic Neighborhood as part of the corridor. The concept was to create a more pedestrian oriented environment by adding pavers to the existing public row, trees, street furniture and extending the curbs farther into the street to minimize the pedestrian crossing the street. The intent over time was to create an urban village that assist in creating a way to concentrating jobs, a mix of commercial uses, public spaces, public transportation, housing and pedestrian activity. The intent is a pedestrian oriented environment where people can socialize, live, play and work through the weaving the fabric of the old community to the new by respecting the history and culture of the existing community. The City of El Paso and the El Paso County wanted to commemorate the Bicentennial of the United States with the design and construction of the Mckilligon Canyon Amphitheater. The project, with a 1500 seat capacity, was designed to maximize the use of indigenous material and be sustainable in its placement in the environment. Limestone from the site work was utilized for the walls of the theater and the ancillary structures. The walls of the mountains, facing the stage, was used to create a quality sound system. The view at the entrance gives the viewer a dramatic view of the surrounding mountains. The theater consist of a parking area, congregational area, entrance, theater seating, and ancillary structures. The theater has been the social mecca of the community. It is used by Viva El Paso, an outdoor stage presentation, that conveys the 400-year history of the El Paso region through music, dance, song, drama, and narration. The cast of 50 perform the story of El Paso and the rich historic culture of the area. This was a joint venture project for the development of a master plan for 15 acres adjacent to interstate 1604 West in San Antonio, Texas. There were two concepts developed that focused on a typical standard suburban commercial development and the other that focused on a new urbanism concept - mixed use, pedestrian oriented environment, major human activity on the first floor and a cohesive architectural pattern. The 15 acres consist of a hotel site, restaurant, retail uses and an educational facility. The concept promotes the principles of new urbanism - walkability, sustainability and public urban spaces. In 2008, the Eagle Ford Shale “oil and gas boom” began in Las Salle county where Cotulla, Texas is located. The size of Eagle Ford Shale is significant and directly impacts 29 counties and 91 cities with memberships in 9 Council of Governments. The impacts on local infrastructure has been unprecedented, particularly in small, rural cities like Cotulla. There are additional demands on existing infrastructures that include local streets, drainage systems, water and sewer systems, existing public buildings and community facilities, housing and educational facilities. In response to these concerns, City of Cotulla took a proactive approach by requesting a proposal from consultants. 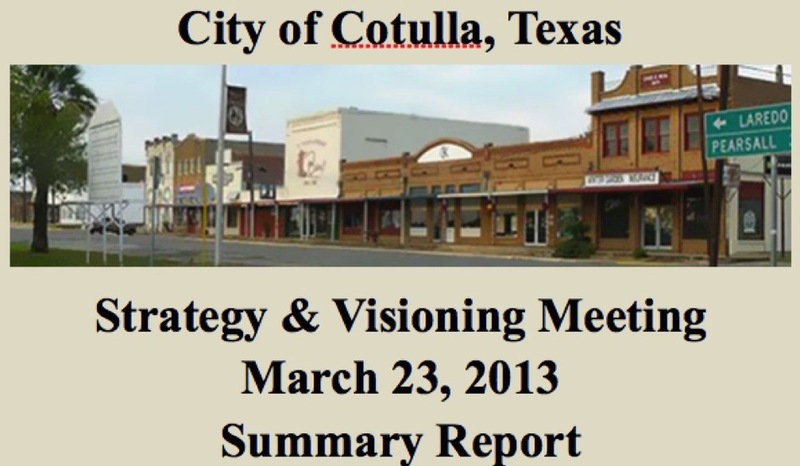 HNTB and Town Planning and Design was hired to develop the strategy and vision for Cotulla. The team engaged the City through an open process, rich with community dialogue and stakeholder leadership in order to balance economic growth with planned management techniques that accurately reflects the best interest of the residents of Cotulla, Texas.